On March 20-27,2016 the Metropolitan Church of Christ invites you to our Passion Week Revival. We will walk the steps of Jesus as He marched toward the fulfillment of the gospel from His Triumphal Entry to His blessed Resurrection. Our out of town guest revivalist is Tim Anderson of Montgomery, Alabama. He will deliver our first message on Sunday morning March 20th on the Triumphal Entry. Our other featured speakers every evening at 7:00 will be Lionel Sims, Anthony Stokes, Alvin Edington, Cedric Payne, Vincent Hawkins, Felix Jones, Cameron Morrison, Kelvin Warren, Charlton Hawkins, and Clint Richardson. 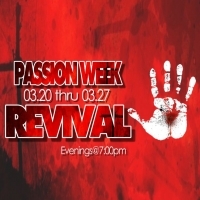 The final week of Jesus' life is often referred to as "Passion Week." It is good to take time out of our lives to contemplate Jesus' suffering on our behalf, but it doesn't have to be at a specific time of year. We can thank Him for His sacrifice and celebrate His resurrection at any time. Nowhere does the Bible command us to acknowledge or celebrate the events of this week as a special holiday. We actually commemorate this each week during communion. The Metropolitan Church of Christ has decided to capitalize on this "season" to teach the glorious hope of the resurrection to Christians and also reach out to those who only come to services during "Easter." Refreshments will be served nightly.